Recently a friend asked me if my children still read aloud to me and how often. 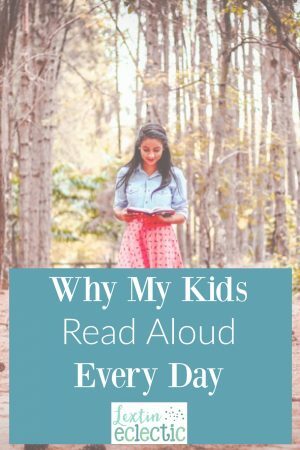 The answer is that yes, my kids read aloud every day. However, I made a bit of mistake with my oldest child – I let her stop reading aloud to me too soon. When I asked her to read part of a book to me a year ago (after not reading aloud to me frequently), I realized that she read without any inflection in her voice. She often skipped punctuation as she read. As a listener, it was difficult to follow the story because sentences and phrases ran together without any stopping points and there was no emotion to keep the listener engaged. I resolved to make some changes in our homeschool to address some of these issues. Now I make sure that my kids have read aloud time daily. They either read parts of a book to me or to each other. No matter their audience, they are practicing reading aloud. What I’ve learned is that reading aloud is a skill that is not mastered by many people. Too often people are uncomfortable and insecure about reading aloud. I’ve determined that my kids will learn to be comfortable reading to others. Reading aloud helps practice fluency. As my kids read aloud, they become more fluent readers and reading becomes easier. Reading aloud makes my kids slow down in their reading so they don’t miss important details. Most people can read much faster when they read silently, but sometimes this is at the expense of details or nuances in the story. Reading aloud gives my kids practice speaking in front of others. Though they are not sharing original thoughts and ideas, they are learning to be comfortable speaking in front of an audience, no matter if the audience consists of only one person. Reading aloud gives my kids the chance to practice inflection and infusing a story with emotion. They can learn skills to help keep a listener engaged in their story and this will help them in the future if they need to give speeches or presentations. Reading aloud allows me to assess how well they are able to read the words and keep up with the flow of the story. I can also see what vocabulary words are pronounced incorrectly and if they are skipping important punctuation marks in the story. Now I have read aloud time scheduled into our day. They read aloud every day and also have silent reading time as well. However, I also make sure that I am reading aloud to them daily to provide a good model for reading. We also make liberal use of audiobooks to train their ears to be filled with well-read stories that are narrated with emotion and good inflection. I wish I had not stopped having my oldest practice reading aloud, but I’m working to remedy my mistake by making read aloud time a priority in our homeschool. And if you’re looking for wonderful ideas for your next read aloud, The Read Aloud Handbook is one of my favorite resources for helping me choose our books. I had never thought about reading aloud being so important, but I can definitely see now how it would be helpful. I personally don't feel very great at reading aloud as I make many mistakes, but maybe more practice would help with that! I've known some people who have been EXCELLENT at reading aloud, and it's such a pleasure to listen to. I can only think that came from daily practice!